Inscriptions: l.l. handwritten in pencil: "Jacob's Ladder"; l.r. handwritten in pencil: "Sister Mary Corita IHM"; l.r. handwritten in pencil: "30. "; verso, l.l. handwritten in pencil: "60-18": l.r. stamped in ink: "An original serigraph from / Immaculate Heart College / Los Angeles 28, California / Do not roll serigraph / Do not dry mount / No refund, no exchange"
"jacob's ladder." 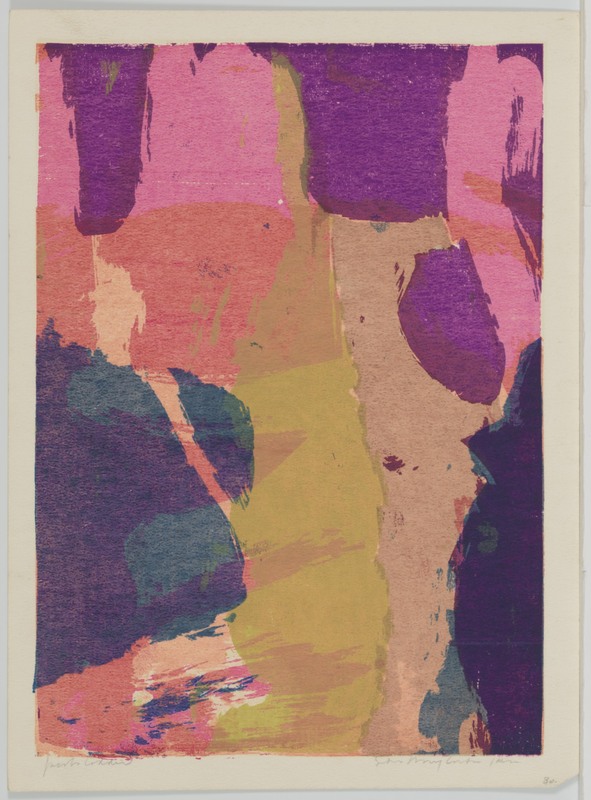 Corita Kent in the Grunwald Center Collection. Los Angeles: Hammer Museum, 2017. https://​hammer.ucla.edu/​collections/​grunwald-center-collection/​corita-kent/​art/​jacobs-ladder/​.